The South Rim Drive in Grand Canyon National Park passes viewpoints of only about 25 miles of the canyon; as with the north rim, the vast majority is very inaccessible, far from any paved road, but there are some other named rim overlooks within reach of the day hikes, including Comanche Point and maybe Cape Solitude to the east, and a group of four promontories to the west, named Mimbreno, Mescalero, Jicarilla and Piute points. These are virtually never visited, but may be reached easily enough, by hiking cross-country over the level, wooded plateau for up to 4 miles, starting at Sheep Tank along the unpaved but quite good quality FR 328, the road to Pasture Wash. Adjacent points can be reached by walking along the rim. Apart from distant helicopter noise and illegal ATV tracks in a few places, this region of the park is completely peaceful and unspoilt, in great contrast to the Grand Canyon Village area, ten miles east. The views include several remote gorges, including the exotically-named Turquoise, Sapphire, Agate and Topaz canyons, many features on the opposite side of the river, and the Colorado itself, which is clearly visible from several locations. The round trip to the four points is 15 miles; the next one to the west (Walapai) is much further away, and would be best accessed from the old Pasture Wash ranger station, 13 miles further along the road, which by this point has become significantly rougher. All these (five) points are named after Native American tribes. Topographic map, South Rim location map. 22 views of the four points: gallery, slideshow. The well-maintained road to Pasture Wash (FR 328) leaves US 180 to the west, immediately north of Tusayan, and like several other nearby tracks into the surrounding Coconino National Forest, the first mile or so is popular for free primitive camping, with at least a dozen pull-outs suitable for RVs as well as cars. 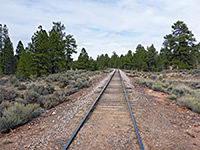 The road is quite wide and the surface smooth for the first 5 miles, until it descends into a shallow valley and crosses the Grand Canyon railway line, where the route bears right at a junction and becomes a little rougher, climbing a slope to the top of a hill and continuing westwards through thicker forest, where the surface is variously rutted, stony, rocky, or sometimes smooth. A treeless sagebrush plain is reached after 8.4 miles, the first place that allows views of the wider landscape, and in this region are several fine campsites, before the road re-enters the woods (10 miles), and while still generally good has a gradually increasing number of rough patches. After 15 miles the road arrives at Sheep Tank, a seasonal waterhole, and this is the place to park, or camp, a little way along a side track to the north. The surroundings are fairly flat and open, ringed on all sides by the low, featureless woodland. The easternmost of the four points, Mimbreno, is 3 miles northeast of Sheep Tank in a straight line, or 4 miles if following landmarks - past the tank, bearing right at a junction then due east along the track, and veering north up a shallow drainage after nearly a mile. This can be followed for about half a mile until it divides into several indistinguishable tributaries, but not far ahead is the long, straight fence that marks the edge of the national park, and the equally straight, disused Boundary Road, which links Pasture Wash with Rowe Well, but has been closed to vehicles (and cycles) for many years, and indeed now shows no sign of any tire marks. From here the edge of the canyon is less than one mile northeast, reached by more easy walking through the woods, up a very gentle incline. Navigation is not so obvious in the forest due to the lack of landmarks but straightforward once at the rim. 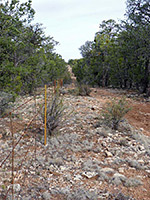 The approach leads to the brink of a typically deep, stepped, red rock gorge (Boucher Creek), flanked to the east by the edge of Eremita Mesa and to the west by the smaller promontory of Mimbreno Point, about one mile away. 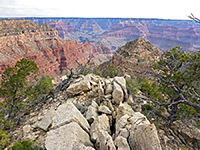 The trees are smaller right on the rim, but other undergrowth is thicker and more varied; including yucca, agave and cacti (opuntia, echinocereus, escobaria), so walking is often simpler slightly away from the edge, though it is quite easy to lose sight of the rim even when still close, owing to the lack of navigation aids once back in the forest. At Mimbreno Point the land tapers to a broad promontory, with a large butte (Vesta Temple) directly in front but 300 feet lower in elevation, so the views are not obscured. Most of the two adjacent ravines of Boucher Creek and Topaz Canyon are visible, though not the Colorado River. The western perspective is soon blocked by a higher and wider butte in front of the next point, while the eastwards views are more extensive. Continuing west, the next point is Mescalero, 1.6 miles away along the rim; west for a while then mostly north. A narrow, unreachable saddle links the point with a big mesa at the same height - Diana Temple - which is relatively wide and occupies about half of the canyon panorama, leaving just a quarter at either side; the adjacent ravines of Slate Creek to the west and Topaz Canyon to the east. At least two sets of rapids are visible, along the Colorado River. Jicarilla Point is nearly 2 miles west of Mescalero Point, set on a big limestone block gradually splitting away from the rim. Ahead is a narrow ridge much lower down, rising to a smaller butte (Pollux Temple), but again there is nothing to block the views. The two adjacent red-walled ravines are Sapphire Canyon and Slate Creek, while on the far side of the river is the distinctive shape of Scorpion Ridge. Rather more of the inner granite gorge is in view in the downstream direction, as the river curves round to the north. The fourth point is Piute, one mile distant though 2.1 miles along the rim, which curves inwards quite a lot, forming a U-shaped bend. The edge of the plateau in the vicinity of the point is crossed by various ATV tracks and animal paths, all running in the same general direction. At the point the rim projects outwards, and steps down to a narrow, protruding slab of flat limestone. The whitish butte of Castor Temple is below, between Turquoise and Sapphire canyons, while the next point to the west (Walapai) is much further north. The views are broadly similar to those at the other three points. The quickest return route from Piute Point is along the rim nearly to its southernmost point then southwest, through half a mile of forest to Boundary Road, continuing in the same direction for a few hundred feet and intercepting an old vehicle track. This leads south for 2.6 miles, past two junctions, back to Sheep Tank.